If you are looking for information on the Hello Eco franchise business opportunity, Hello Eco franchises or Hello Eco franchising, then you have come to the right place. Hello Eco is a global, value added franchise network that exists to provide products and services to business's that want to enhance their environmental alignment while building overall business value. Our progressive mentality exists throughout our brand today and extends into our attentiveness to the environment. Pre-training: Self study activities to develop an initial knowledge base of the business and industry. Hello Eco Corporate Training: Located in San Diego, you will spend 4 days attending the Hello Eco New Owner training program. Post training: This part includes final preparations to launch your business. Business Coaching: Once you launch your business, Hello Eco works directly with you for the first 12 weeks in a detailed weekly coaching session. 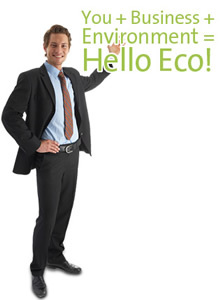 Hello Eco Continuing Education Program: At Hello Eco, we like to say that our training program never stops. Our Hello Eco owners not only have the support of on-going training but also become key participants in sharing best practices. Hello Eco positions you to hit the ground running. With a proactive and strategically based marketing program, you will be armed with proven customer developments tools that drive business results. We utilize a number of different marketing tactics to create customer interest in our offering.